Autograph Letter Signed to Henry Davis. Charlestown, MA, 20 January 1817. Small 4to (24.5 cm; 9.75"). 3 pp. plus integral address page..
Below a partially printed receipt form of the American Board of Commissioners for Foreign Missions — that Evarts has completed in manuscript acknowledging receipt of $53.12 as donations from Sunday Societies, said money forwarded by the Rev. Dr. Henry Davis, president of Middlebury College — is a serious letter to President Davis. Evarts writes that he regrets "the unfortunate issue of your attempt to get a philosophical apparatus for your College and the school's difficulty in raising money. 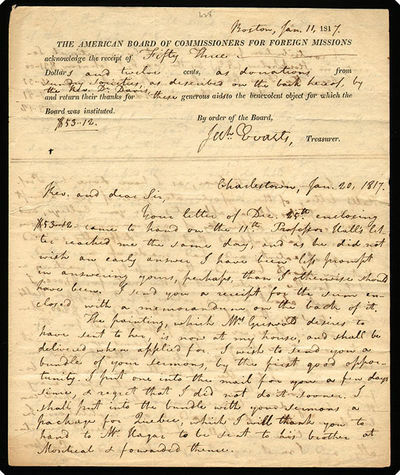 The American Board of Commissioners for Foreign Missions holds a note for $1000 that the college owes and Evarts, the organization's treasurer, asks that if the college cannot pay at least some part of the principal, can it at least pay the interest promptly and send a paper guaranteeing payment?